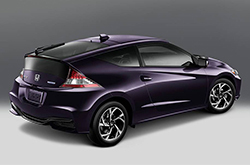 The 2016 Honda CR-Z is a two-seater hybrid vehicle many buyers will love. Offering great fuel economy, practicality and appealing looks, the sport compact is an ideal choice for those in need of a fuel-efficient two-seater. Slightly updated for 2016, the CR-Z features revised exterior styling, new technologies and more standard amenities across its roster. Available in three trims - LX, EX and EX-L Navi - the hybrid car benefits an array of different buyers in today's market, and if you'd like to learn more about the vehicle, be sure to read our 2016 Honda CR-Z review below. The small, lightweight 2016 Honda CR-Z in Arlington is a hybrid sport coupe fit for the masses. 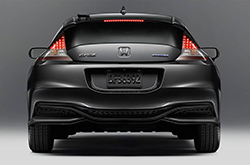 For the new model year, the CR-Z features revised front and rear-ends that give off a more athletic appearance. Additionally, the exterior design is sleeker than the previous model and the interior features a new dashboard that is futuristic and sure to attract new car buyers. Aside from styling modifications, the CR-Z also gains a new 7-inch touchscreen and a blind-spot warning system designed to help prevent accidents. Antilock brakes, stability and traction control, a standard rearview camera and a collection of airbags can also be found in the two-seater, improving safety. 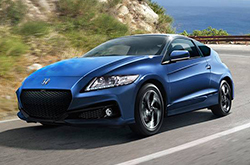 Powering the 2016 Honda CR-Z in Arlington is a 1.5L four-cylinder engine and electric motor that combine to deliver 130 horsepower and 140 lb.-ft. of torque when working alongside a six-speed manual transmission. With a continuously variable transmission, the CR-Z's torque decreases to 127 lb.-ft. Models with this transmission produce an EPA-estimated 37 mpg combined, 36 city and 39 highway, while manual models generate 34 mpg combined, 31 city and 38 highway. Manual-equipped models can also jet from 0 to 60 mph in 8.8 seconds, which is a quick time for a car in its class. Keep browsing our 2016 Honda CR-Z review below for more details about the new hybrid and its range of features. Please call 844-875-1785 for further assistance. The 2016 Chevrolet Sonic, Mazda RX-8, Hyundai Veloster and the Ford Fiesta are outranked by the 2016 CR-Z in a multitude areas. If the CR-Z's passenger-oriented cabin amenities and superb looks don't prove to you that it's the perfect vehicle for you, we're sure its competitive MSRP will. Many drivers in choose it because it's a remarkable value; compare its price to the vehicles in its class to see for yourself. See our Quick List below to find out more! The Honda CR-Z review above, along with overviews of prior models and other 2016 Hondas, will help make finding your next car a breeze. 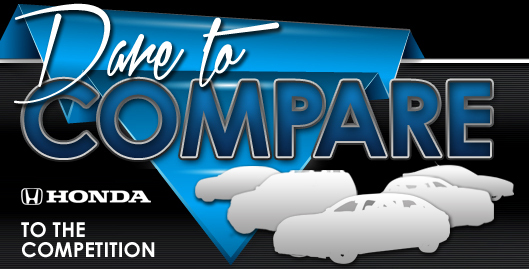 We stand out from the crowd by offering reviews designed to assist you in your vehicle search. Want to know about the 2016 CR-Z's powertrain options and other specs? As your Honda dealer, you can count on us for credible information. Now that you've learned all about the 2016 CR-Z, we'd love to chat about how we can assist you; use the contact form to message us today to learn about financing offers and arrange a test drive!